American Mystery Classics, 9781613161142, 216pp. Hildegarde Withers is just your average school teacher--with above-average skills in the art of deduction. The New Yorker often finds herself investigating crimes led only by her own meddlesome curiosity, though her friends on the NYPD don't mind when she solves their cases for them. After plans for a grand tour of Europe are interrupted by Germany's invasion of Poland, Miss Withers heads to sunny Los Angeles instead, where her vacation finds her working as a technical advisor on the set of a film adaptation of the Lizzie Borden story. The producer has plans for an epic retelling of the historical killer's patricidal spree--plans which are derailed when a screenwriter turns up dead. While the local authorities quickly deem his death accidental, Withers suspects otherwise and calls up a detective back home for advice. The two soon team up to catch a wily killer. 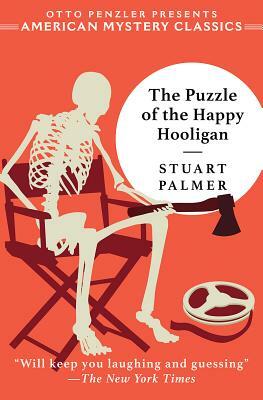 At once a pleasantly complex locked room mystery and a hilarious look at the foibles of Hollywood, The Puzzle of the Happy Hooligan finds Palmer, a screenwriter himself, at his most perceptive. Reprinted for the first time in over thirty years, this riotously funny novel shows why Hildegarde Withers was among the most beloved detectives of the Golden Age American mystery novel.